Almost clear presence with very nice grassy Sauvignon aromas of grapefruit and tropical citrus. Palate--Nice acid foundation, citrus, limes, summer fruit and a racy finish of creamy compote. 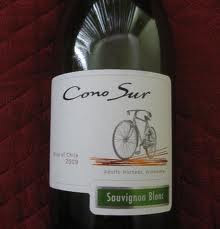 Cono Sur, Chilean wine is always a decent value so raise a glass. Palate--A bit flaccid but juicy and tasty with loads of fruity tropics. simple ans tasty so chill it down well and at $5-$7 it is a decent summer refresher as an aperitif. Raise a glass. Crystalline purple-garnet hue with ripe strawberry bouquet, and loads of cinnamon. Palate--Nice structure, with tasty fruity fruit and lively acid. It is fresh with a decent finish on a touch of smoke. I paid $9 for this wine and it is a really nice pinot for the price so raise a glass! Black cherry hue with ample bouquet of ripe juicy blackberries on a bed of milk chocolate with cola or root beer aromas and a top off of crushed black fruit. Palate--Soft presence with solid structure. Bready fruit, with significant tannins to keep this nice wine going for a few years. Subdued black berry on a layer of milk chocolate. 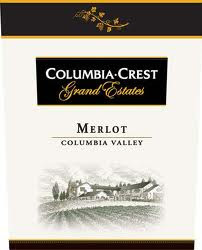 Columbia Crest is one of those vintners who just make quality offerings regardless the price point, regardless the grape. This is a solid wine at $11 so raise a glass. Pale straw presence with buttery sweet, tropical fruit aromas with creme brulee notes. Palate--racy acidity with green apples galore,citrus foundation,some minerals and a fruity finish. Last second invite over to friends house for seafood chowdah so the least I could do was bring this lovely white Burgundy for my budding oenophile friend. Burgundy Chardonnays yield the stripped down beauty of the grape. No pretentious manipulation, artificial color or petri dish flavors; Just pure Chardonnay. This wine will run you anywhere from $18-$30. On the lower end of the price point it is a value;on the higher end a nice treat so raise a glass! The Legacy glass from Chevalier Collection is a unique approach to wine aeration. 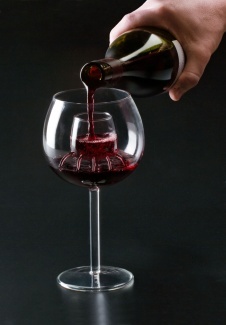 With a 7 ounce internal aeration vessel built into the Pinot Noir-style glass, every pour is sure to open up and breathe as the wine drains from the internal vessel through several small holes into the larger bowl. The issue with this approach to aeration is that you have to really like the glass. If you don't, you won't want to use it. At home, I only use specific stemware. Here's the deal: wine aeration works and a lot of devices and techniques can be used. Young red wines, in particular, benefit from immediate aeration. In my experience, the flavors develop more richly and rough edges tend to soften. Does this glass accomplish that? Yes, I believe it does. You can check it out yourself for a promotional price of $10 per glass. See www.chevaliercollection.com and raise a glass! Dark garnet hue with spice, vegetal blackberry jam, and light tobacco. Palate--Silky texture that is integrated with tar and decent blackberry fruit, that while a bit subdued is nicely balanced on a frame that tastes older than it is. It finishes with a touch of oak and smoke. This is drinking really well for such a young Grand Vin De Bordeaux. I paid $10 for it at Trader Joe's but read on line where someone found it at a TJ's for $6. At $10 it is worth buying a few bottles, at $6--knock yourself out and raise many glasses! Another Trader Joe's wine I grabbed it more out of curiosity than anything else. 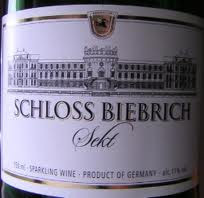 First German sparkling wines are not often seen in my neck of the woods and at the price of $6 I wondered if it could be drinkable. Pale yellow presentation with scant, pin prick bubbles. Scant aromas but what is there is flowery and perfumy, non-descript. Palate--a faint nuttiness on an off dry foundation that is lacking most everything but chilled way down, as a toasting wine with unsuspecting friends it is actually pretty decent for the price so raise a glass. Black cherry hue with fruit galore rising from the glass while sitting. Perfumey notes of dill, spice and vegetal hints with herbal fruit, green pepper and is getting "crazy" good as it warms up from cellar temp. After breathing, there is a cocoa foundation with blackberry fruit and plum all over the place. In the mouth this wine is plush with minerals, silky tannins, gorgeous balanced fruit and structure with a slight smoky finish. This is a marvelous wine (81% Merlot, 19% Cab Franc) which I bought over the internet for $15 and 99 cents shipping! I can tell you already this wine will definitely be in the running for one of my top 10 wines of 2011. Raise a glass! This wine helped put New Zealand Sauvignon Blanc on the map many years ago. The 2009 edition has clean lines and tastes well made. 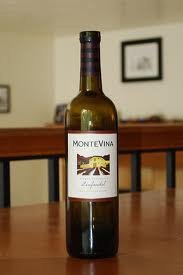 The citrus and lemongrass are appealing and the additional layers help give the wine extra depth. Expect to pay around $25 and pair it with a variety of seafood, chicken, or vegetable dishes. Raise a glass! Deep black cherry hue with fresh bright fruit from the glass in the air. Gorgeous! Black cherry and berry fruit in the nose with licorice down deep. What to make of it? It is possible that it just needed more ti me to open up. As the evening progressed over our rack of lamb dinner with friends, it did seem to be trying to break out but it never arrived. People speak of wines going through a "dump phase." I can't certify that is a real phenomenon objectively but perhaps that is what this is. I only know this was a disappointment to me and our dinner hosts. I paid around $30 for this 3-4 years ago. It just didn't deliver. Slightly aging garnet with brambly, wild berry and cranberry bouquet with blueberry note on licorice. Palate--Celery first impression with stingy fruit, overall berry tastes with solid Zin, finish that's a bit rustic. I believe I paid around $9 for this and would probably pass for a Cline Zin at the same price. Raise a glass though of good Zin--California's own native grape! Nice rich looking hue with intensity and a bouquet of lovely raspberry with loads of dill underneath and sweet tobacco. Palate--Full flavored, nicely textured raspberry fruit with luxurious mouth feel. Wow! 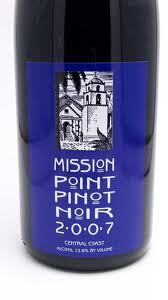 This is a nice Pinot from the winery that I named my 2010 winery of the year. They just do it right and at $17, it is a nice varietal, Pinot Noir. Raise a glass. The WCB has never broached the area of Winery of the YEAR and neither (NW) nor (Billy) of this blog were consulted about my doing so. That's the advantage of being the founder and "Senior Tasteman" not to mention father-in-law and father, respectively, of the other two bloggers of our award winning blog. The Four Bears wines are not distributed in my state yet(Maine) which makes my designation of Sean Minor Wines as "Winery of the Year" that much more intriguing. Sean and Nicole Minor are relative newcomers to the adventure of wine making having begun in 2005. Their story could be mine in many ways as to their motives of getting into the craft and business. Sean writes--"Not long after Nicole and I were married, we discovered that our second largest monthly expense was wine. We enjoy wine every day with dinner, when friends and family come to visit, during celebrations... actually, I can’t think of time we don’t enjoy wine." So fulfilling a dream they ventured out and took a chance. In the competitive, global industry of wine, that takes more than a hectare of boldness. There are a handful of producers who yield quality, value wines vintage after vintage. Sebastiani and Columbia Crest come immediately to mind. They are the kind of wineries that no matter what the varietal or blend might be, they just do it well and at a price point that normal people can afford. Sean Minor wines are right on this same track. Sean writes--"After a number of years in the industry, I knew there had to be a better and more affordable way to produce great wines that didn’t have severe consequences on the pocket book." As far as I am concerned, they have succeeded. Their success with their wines is an extension of their commitment to the most important things in life--their children and each other. You may notice that one of their wines--the Central Coast Chardonnay 2008 came in at the #4 spot on my top ten wines of 2010 and frankly, their Pinot Noir(Carneros) and their Napa Cabernet Sauvignon are already standouts for the top ten of 2011. I am pleased to extend this award and my congratulations to the Minor family and hope that they stay focused on what is truly important. For at the end of the day, a very wise and wonderful man said, "What does it profit a man if he gains the whole world but loses his soul?" 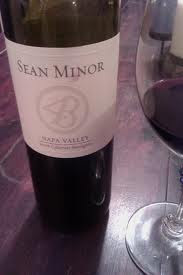 Raise a glass to Sean Minor wines and their 4 Bears! (PB's) Top Ten Wines of 2010! My top ten picks for 2010 are not necessarily the "best" wines I have had this year. Some of the wines we review are either not readily available or are out of what I would consider a price range that most normal people would pay for a bottle of fermented grape juice. So the wines below are wines that clearly stood out to me, and are wines of which I have consumed several bottles and then looked for more. You will see they are within the price range of most everyone's budget. I should mention lastly, that with the exception of the #1 wine of the year--a clear winner--the number rankings of the subsequent wines get very loose. All this means that every wine on this list is worth looking for and buying a bottle or three, so happy hunting and here is to raising a glass to the next top ten of 2011! Here is my entry from when I tasted this wine: "This 'Super Tuscan' is the leading contender for my "wine of the year" recognition and I doubt it will be displaced." Indeed, it was not unseated and easily takes top honors for this year’s wine of the year! It is a blend of Cabernet Sauvignon, Cabernet Franc, Merlot and Sangiovese and it is positively awesome! On the pour it is heavily pigmented leaving color on the crystal glass. The bouquet is full of intense aromas of spicy fruit, nice cherry, sweet tobacco aromas and a touch of earthiness that tends to typify Tuscan wines. Palate--Almost thick and textured with plush tannins and rich cherry-berry flavors, espresso, deep dark baker's chocolate, and then more dark fruit with dried cherry hints. It is all harmonious with a layer of bright fresh cherries. Wine Spectator gave this wine 93 points and earns every point of that! For such a young wine it is drinking wowingly! Here's the best part, this wine can be found for under $20 but even at $30 it would be a bargain. Raise a glass to sensational Super Tuscans! This German gem from the Rheinpfalz was shipped by Rudi Kiefer. The color on the anxious pour of this aged wine was a remarkable amber hue that looked like it was fitting for a gem stone set as a pendant. The bouquet was honeyed caramel with stewed apricots and dill with orange rind aromas notes that were amazing. Palate--Elegant, rich, velvety thick and marvelous. Flavors of peach nectar with caramel hints on a foundation that is perfectly balanced between luscious sweetness and solid acid. No label was available on line that I could find nor could I find a reference a price but a wine like this is priceless. Suffice it to say, this is a wine I will always remember! This "Vintage" Oporto is deeply pigmented with beautiful floral violet fragrances with green tree subtleties. Palate: Thick and creamy, rich, plush, sensual with big dark berry fruit; I am nearly struck dumb at how utterly amazing this vintage port is, yet so young. This is a love affair in a bottle, absolutely wowing. I reluctantly paid $38 for a bottle of this at a Trader Joe’s in Boston. I have since had my Los Angeles daughter find me a couple more bottles and bring them to Maine. Note well--there are many "port" wines on the shelf, some which contain the word "vintage" in the title especially "Late Bottled Vintage Port." These are NOT the same as "Vintage" port and normally the price is telling. This is why I was so skeptical of this true Vintage Port being drinkable at this young age as well as the fact that 2007 is one of the best vintages for Port in a lifetime. But this is the real deal and a ridiculous value at this price. Considering Vintage Port is meant to age for a long time I cannot even imagine what this wine will be like with some years on it. Raise a glass and say WOW! Palate--rich and relaxed with young tannins that will turn to velvet in a couple years. Ample berry and black cherry with a touch of cola nuances and light cinnamon notes; should continue to evolve in the glass as it warms up. After an hour and a warm up this is a superior Cab and at the price of $12 (it runs around $18 most places) it is a super value wine that is delicious and a fine example of how good Cabernet can be. Raise a glass of this VERY nice wine! 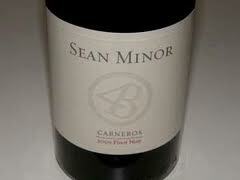 This wine was sent to us by the folks at Sean Minor wines. Hang onto your palates and get ready to run to find this wine! It presents with a light golden hue and a flowery, sweet, candied bouquet enticing my nose while sitting on the table in front of me. Really lovely! Palate–there is a fleeting but definite caramel front with solid structure that is integrated with pineapple and citrus on a buttery texture all of which finishes elegantly with long, sweet cream and light tropical fruit. THIS is what wine should be. When you consider it runs about $13 but is made like and tastes like a Chard costing 3 times as much, it is a worthy pick for my top ten of 2010. This Central coast Chard is a superior wine and a SUPER value so raise several glasses! This also happened to be a wine that was sent to us for review. It presents with a nice, medium golden hue with mouth watering pear and green apple perfume scents accompanied by sweet, powdery tropical fruits. Wow! This is one of the best Chenins I have ever had. I paired it with sushi (which means the challenge of wasabi and ginger) and it was simply wonderful. At $15 this is a grab me and raise a glass wine! A gentle golden hue with an awesome bouquet of spicy fruit with touches of citrus, light pineapple and a powdery, sweet fragrance. Fantastic! Palate--Minerals abound as you would expect from an Alsatian white, on an off-dry foundation of yellow citrus with an almost Sauvignon Blanc-like grassy note. There is a slight touch of green apple that is delightfully balanced on a solid acid base to make this a wonderful wine and a super value at this price (*$10) so raise glass after glass! *A grocery chain in our area was running some close out sales on numerous wines and this was one that was one of those "finds" you celebrate. Trimbach is a big-name Alsatian producer and Gewurztraminer is the signature grape of Alsace. If you follow this blog, you know that Gewurztraminer--pronounced ga-Vurts-tra--MEE-ner--is my favorite white grape and my perennial spring/summer wine for celebrating, warm sunshine, spicy foods, the sun rising, and the moon rising. Trimbach does Gewurz well and this wine typically runs $22-$28. Light golden straw hue with ample bouquet of tropical fruit with melon, powdery vanilla and cream notes. Palate--Racy acidity, with solid structure and loads of citrusy, tropical fruit compote all wrapped into one big fruity, value Chard. It even has a finish that lets you know what you've been drinking after the fact. Remember the axiom, "You get what you pay for when buying wine?" That's actually a pretty good rule to a certain extent. One Exception are "value wines" which are wines that trump the wisdom of the rule. There can be numerous reasons why a wine is inexpensive with respect to the quality you get. One is production quantities. Fetzer kicked out nearly 630,000 cases of this wine. That is a HUGE production which yields an economy of scale. This wine is typically found for $10 but Trader Joe's sells it for $7. At either price, it is a value wine and one that should be easy to find so raise a glass! G & M Wachner produces this wonderful Gewurz for a mere $12 from the German region of the Rheinhessen. It has a lightly golden hue and sweet pie spice with loads of tropical fruit in the bouquet which is outstanding presenting a little caramel note as well. I LOVE this grape! Palate–There is a tropical fruit blast on the front palate with delicious sweet, mango and papaya on a structure that is up to the task. Wow! Chill this down for a real treat. It is great as an aperitif or with those difficult Asian dishes that tend to stump people when pairing. What a nice wine at $12 and a gorgeous label to boot! Raise a glass! Trader Joe's is always good to shop for some super wine values and this was another one I grabbed a half case of when in Boston. It has a garnet hue with some depth and bouquet of distinction with earthy fruit along with touches of raspberry, cranberry, and pomegranate. Palate--Tasty and juicy with black pepper on opening with loads of minerals and cherry fruit. With some air, a nice thick layer of milk chocolate rises into the air and an integrated palate of dried cherries, and bread with chocolate carry through to the foundation. This is a lot of wine for the $6 price tag which explains why I bought a half case and will buy more if I get down there in the near future. Raise a glass to another TJ ultra-value . Pretty presentation with crystal, watermelon juice hue. It has a solid bouquet of really gorgeous, sweet fruity aromas of fragrant strawberry and vanilla. Palate--Juicy, straight forward strawberry fruit on a well made structure that makes it “real” wine! Chilled down it is a great summer quaffer for the porch or picnic. Raise a glass to the emerging roses that are often overlooked! Gorgeous deep garnet hue with bouquet of lovely plum and background spice with blackberry, cola and cigar box nose. 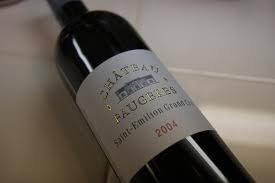 Palate--First impression is a more mature wine than what it is because it is so supple with fruit forward dark berry fruit, a touch of breadiness. It is fruity, lively, with classic Cabernet presence. This wine is drinking really well right now and yet will improve for several years. Finishes off with a slightly vegetal, berriness that lingers. This wine will run you around $17 and is an excellent example of Cabernet Sauvignon eclipsing Cabs considerably more expensive making this a value Cab. So raise a glass and check back for my top 10 wines of 2010 and a surprise announcement of a first for the WCB. I will be announcing my pick for winery of the year. Bouquet--Full of nuttiness with slight fruit underneath on a baked caramel foundation with a slight pruney quality that reminds me of a Madeira. Palate--Slightly sweet, nutty with baked, stewed fruit and a pleasant fruitiness on the finish that lingers. This wine was a sparkling red from the Cote D'Or which a friend obtained 7 years ago while doing work on a house as it was found in the basement(?) and was given to him to take along. I could not find anything about this wine on line but it was quite old. I did find an old print ad on E-bay from 1964. The cork was in poor shape and of course there was no fizz left in this old wine. That it was drinkable at all was amazing as I get the impression that this was not a "high end" wine when it was made. This was an education and a unique treat. Thanks Tom! So raise a glass to the adventure of wine! Vintage Port is always a treat! PB (0f The Wine Cask Blog) supplied this bottle at a holiday gathering and we enjoyed it over two evenings with chocolate torte and on its own. This wine is a relatively good deal at $45 and sipping on small pours makes it go a long way. What I like about this Fiest is that it's quite dry for a Port but still has density and flavor. At 13 years old, it shows no signs of age at all. This also would have been good with a plate of strong cheeses. Raise a glass of Port!